RVnGO is America's best marketplace to find RVs to rent in Idaho. Find your RVnGO! Discover an assortment of materials at the Museum of Idaho, which references the scientific history. The gallery's permanent displays include "Falcon Rock," which depicts provincial life in the 1880s, and "Race for Atomic Power," which tells of the country's commitments to the field of atomic knowledge. The museum also offers a regularly changing series of exhibits, covering topics like the human body, the Lewis and Clark expedition, dinosaurs, and insects. Magma streams run through the fields of central Idaho, making for an exceptional and intriguing landscape, in addition to giving a home to hearty plants and untamed life. Start your visit at the Craters of the Moon where you'll learn about the scenery through several displays and film. A circle drive will take you through a segment of the national landmark, with stops to investigate magma cones, craters, and lava flows. Trails are open during the winter months, offering cross-country skiing and snowshoeing. There are various campgrounds for a RV trailer rental in Idaho close to the Craters of the Moon National Monument and Preserve. Situated in North Idaho, Lake Coeur d'Alene is long and twisting highway with miles of forested shoreline, sandy beaches, and inlets that house a perfect play area to boaters, fishers, and paddlers. The city of Coeur d'Alene sits at the north end of Lake Coeur d'Alene, and offers shopping, eateries, one-of-a-kind hotels, and magnificent parks for RV rentals in Idaho. Even if you are not staying overnight you can still enjoy the Coeur d'Alene Resort's amenities, which include a full-service spa and plenty of restaurants. Bear Lake State Park of high mountain valley, sits in the southeast corner of Idaho, close to the Cache mountain run. At 5,900 feet tall, the recreation area offers a wide assortment of both summer and winter activities for those traveling in a RV rental in Idaho. A well-known spot for lake lovers, Bear Lake consistently has around 15,000 campers visiting throughout the year. Ideal for a RV rental in Idaho Falls, the Snake River RV Park and Campground is just a mile away from the downtown region and it's greenbelt. It is an incredible home base to explore the city and its encompassing territories. It has 90 accessible spaces, 60 of which are full hookup spots with BBQ barbecues, fire rings, tables, and space for slideouts. Offices and grounds include heated pool, jacuzzi, play area, horseshoes, wi-fi access, RV stockpiling and supplies, restrooms and showers, and laundry rooms. In the city of Coeur d'Alene, Blackwell Island RV Resort is the perfect place on the water! If you want to enjoy Idaho's beautiful lakes, this RV Park is the go-to spot. It has 182 accessible full hookups with space for slideouts. It can house a wide range of RVs including a Class A and Class B RV rentals. Offices and comforts include a wide range of water activities, nature trails, outdoor games, game room, rec halls, horseshoes, play area, wi-fi access, fishing guides, staffed and self-serve RV wash, restrooms and showers, RV stockpiling and supplies, and laundry rooms for your RV trailer rental in Idaho. Stop season is from April 1 to October 15 for any outdoor camp tenting! The Lewis Clark Valley Dogwood Festival happens in the city of Lewiston each April. It is a month-long celebration which includes a dog show with more than 180 thoroughbred canines, works of art, culture, entertainment, lots of good food, lager and wine sampling, kids activities, family fun, and games! Take in more about the city and its kin at the Dogwood Festival for a howling good time. The state of Idaho is known as "The Fiddle Capitol of the World" and the National Old Time Fiddlers' Contest and Festival is held in the city of Weiser each year in late June. The celebration was built 60 years ago and the great fiddlers world-wide make their way here to compete in what is frequently called the "Superbowl of Fiddling." This week-long event includes live exhibitions of widely acclaimed fiddlers, banjo challenges, a parade, art and antiques sellers, and lots of amazing food. Bring the whole family to revel in some serious knee-slapping tunes! Under the radar for most sightseers and travelers, but donâ€™t overlook it Idaho, its unique charm will make you fall head over heels. 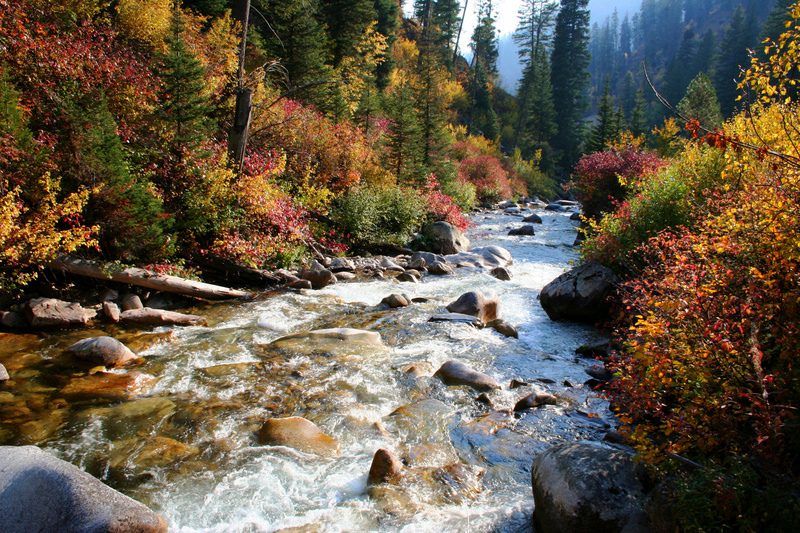 Book a camper rental to Idaho at RVnGO and begin investigating this lovely state!